BRIGHTON, Mich - As we make our way into the most wonderful time of the year, we can't help but think about our community and what this season means to you. Brighton Ford feels that everyone deserves to have something to believe in and we are very curious to hear what you have to say! 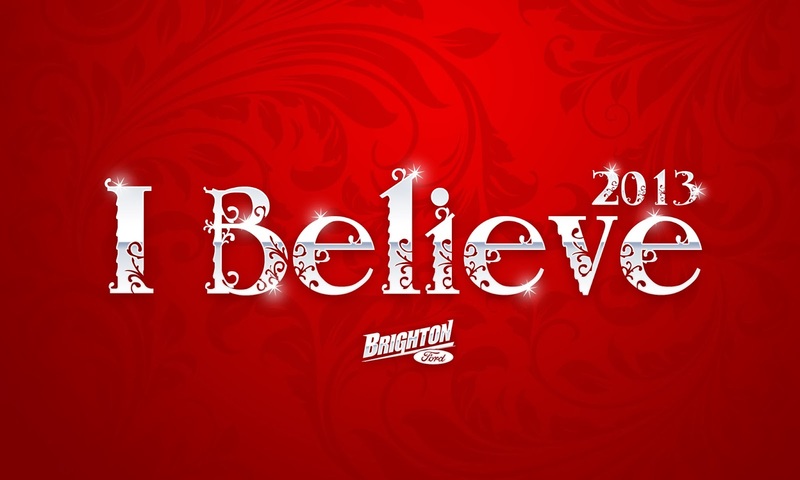 Visit BrightonFord.com/Santa and share your "I Believe" story with us at Brighton Ford. This website is a special place where you and others in the community can write your thoughts about anything you truly believe in! It is the importance of good will, the value of family, or Christmas miracles? Maybe you have a favorite Christmas memory you would like to share or would like to tell us what you believe this time of the year is all about. We want to hear it all! Log onto BrightonFord.com/Santa today to submit your thoughts and read the other "I Believe" stories shared by others in the community. On Wednesday, December 11th, share the power of believing with your children when Santa Claus makes an appearance at Brighton Ford! We are thrilled that even with Santa's hectic schedule, he has promised to stop by the 14th Annual Holiday Window Painting Event at Brighton Ford. Watch your child's face light up as they have their picture taken with the man himself. As a gift to you, those photos will be available the very next day to download and print offline for FREE! This is a great event for all ages, allowing us to give the children of Brighton the very same joy and excitement we all knew so well when we saw Santa as a kid. Stop by Brighton Ford from 5pm - 7pm on Wednesday, December 11th for great food, Christmas cookies, games, and a photo with the man in the red suit! Don't forget to visit us at BrightonFord.com/Santa to share your "I Believe" story with us at Brighton Ford as well as see what the rest of your community believes in! Your face will light up too when you see the great selection of New Ford Cars and New Ford Trucks we have at Brighton Ford. We are proud to serve Southfield and the surrounding areas with exceptional customer service and a wide variety of Ford vehicles. Visit us at Brighton Ford today to find yourself an early Christmas present!